Cutlog NY, New York, May 10-13, 2013. Convergence is an installation that presents a sonic impression of information saturation, with increased access to information being represented as an increased level of noise. The concept of Convergence was chosen as a metaphor for the implications of data consumption via the Internet. Real-time data is converted into sound, and converged into a central location where the sum of the information may be experienced by an individual. We chose sound as a the medium for our first installation because it is an essential tool for the transmission of information, ideas, and meaning. However, when disparate audio sources are experienced simultaneously, the ear quickly begins to perceive the sum of the information as a cacophony. This cacophony obfuscates the underlying meaning of the individual streams. 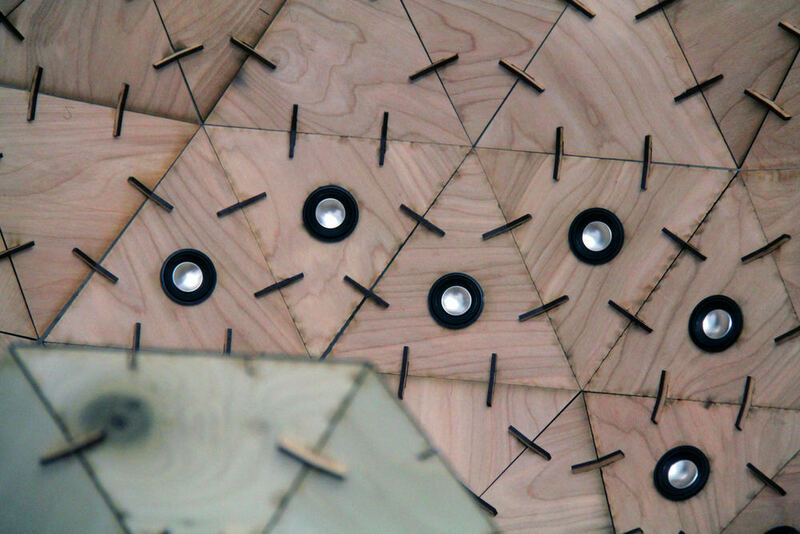 The final spherical form of the piece was chosen as a way of expressing the convergence of multiple data sources into a single point. In the installation, custom software synthesizes a multitude of globally trending tweets as people approach the sculpture. Convergence was on Display at the CutLog ArtFair in NY on May 2013.